PBS has announced that the third season of Masterpiece Theater’s Downton Abbey will debut on January 6, 2013. The show premiered in the UK on September 16, 2012 on ITV. According to the Hollywood Reporter, the show boasted 8.6 million viewers, roughly 34.6 % of the viewing public in that time slot. Downton viewers are many in number. According to the PBS web site, a startling “17.1 million viewers made Downton Abbey, season 2, the most watched Masterpiece series on record.” Reuters noted that “What sets Downton Abbey apart is the buzz the show is creating on new social media websites like Twitter and Facebook.” This is absolutely true. A cursory check of Facebook reveals an uptick in Downton chatter as the new season approaches. The cast is anchored by Hugh Bonneville, Elizabeth McGovern and Dame Maggie Smith. Dame Maggie plays the wry matriarch, Lady Violet. Her quips alone are reason enough to tune in. If you look up Maggie Smith on YouTube you can view a gallery of Lady Violet’s most stunning retorts. Season three will be enhanced by American actress Shirley MacLaine. She plays Lady Cora Grantham’s American mother, Martha Levinson. 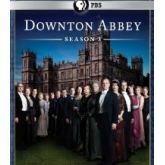 Downton Abbey season two is available at various outlets. The blu-ray is $24.49 on Amazon and and $34.99 at pbs.com and Barnes and Noble. The blu-ray version is currently selling for $21.00-$35.00 at the Barnes & Noble Marketplace and used on Amazon. Season three is available for preorder on amazon for $44.99; it’s set for a January 29, 2013, release date. Loved Downtown Abbey-watched it on Netflix. 3rd series will be out Jan 2013. Shirley MacLaine! LOL That will be an interesting match for Lady Violet. Great choice! this is disappointing though. it was supposed to premiere now! Here’s the link to my story.